Penn Manor Productions will present Radium Girls, by D.W. Gregory, as the fall play at Penn Manor High School on November 16-17, 2012. 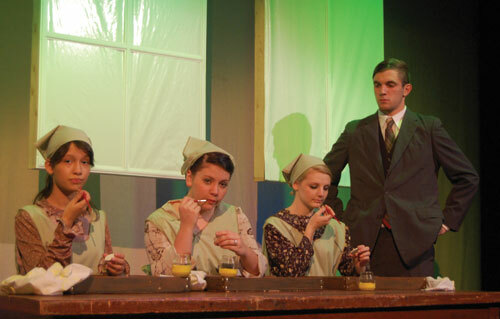 Inspired by a true story, Radium Girls is about the 1920’s dial painters that work at the U.S. Radium Corporation. The three girls later find out that the radium that they have been working with was harmful. We follow them through sickness, lawsuits, hardship, and the fight for justice. Other roles are played by: Alyssa Crook, Paul Harrold, Cobi Kremer, Jesse Landis, Dustin Schneider, Dani Shaub, and Lydia Selman. Tickets may be purchased in advance through any cast or crew member or by contacting Melissa Mintzer by phone (872-9520 x1515), by email (Melissa.mintzer@pennmanor.net) or by filling out a ticket order form online at the Penn Manor Theatre Blog website: http://blogs.pennmanor.net/mmintzer/. All seats are reserved on a first come basis. Adult tickets cost $7.00 and student tickets cost $5.00, if purchased before November 15th. Remaining seats will cost one dollar more in the lobby on show nights.